The DPC’s CEO, Manuel Domingues, and the taxes director, Adriana Costa, took office as effective advisory counselor and collaborative director of the Union of Accounting Companies of Rio de Janeiro, SESCON RJ. The ceremony took place on Friday, March 29th, in the noble hall of Sindicont Rio. The entity represents the accounting services, advisory, examination, information, and research companies in 73 municipalities of the State and its mission is the provision of services that contribute to raise the professional qualification and business training of members, respecting the ethical and moral principles of the category. Another 30 renowned professionals in the accounting market also took office in their positions to act in the next two years, together with Renato Mansur, who assumed the presidency. 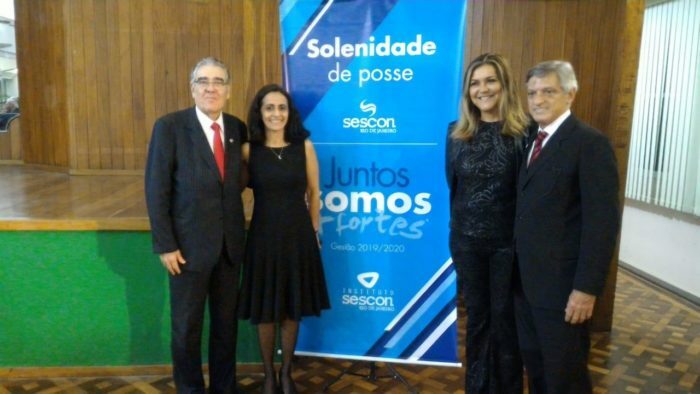 In the photo: on the left, Manuel Domingues and Adriana Costa; on the right, Marluci Azevedo, DPC’s accounting director, and Renato Mansur, president of SESCON RJ.